Oh, to be Mister Jalopy. We say this now and then, but we never get around to doing so. San Pedro, undoubtedly, has some fine garage sales. We mean, just look at the place! But we're sentimental and have a hard time throwing away junk mail at times, and we've got a nice third of a triplex largely held together with garage-saled furniture, both restored and unrestored. Not to mention trinkets galore. 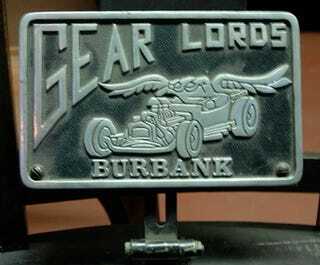 But garage-saling, junkyarding and flea-marketing are skills necessary to any old aficionado of old cars. Just ask Bumbeck and Martin. Spinelli likely lives in a hatbox and Wert's sportscoats wouldn't survive a day of garage sales. The Loverman sensibly satisfies his old-car jones by fiddling with other folks' vintage vehicles. Me? I need to start waking up earlier on weekends. And maybe have a garage sale of my own. Mid '90s nostalgia's on its way, right?